The Lucca Anfiteatro was a Roman amphitheatre in ancient times with about 10,000 seats. 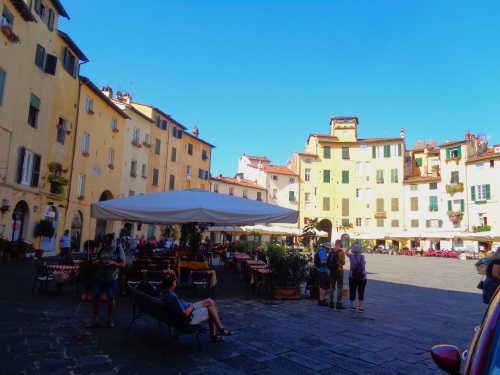 Today the square in the old town of Lucca, where the Arena used to be, is one of the most beautiful squares in Tuscany. The present Piazza dell’Anfiteatro in Lucca still has the old oval shape of the amphitheatre from the 2nd century AD. Houses were built in the Middle Ages around the arena, where the auditorium used to be. The original arena became a square. Today there are about 10 restaurants and cafes on the large square. There are 4 big gates from the Roman times. 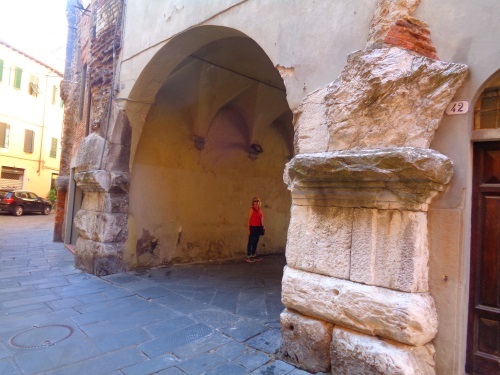 Through these you could enter the arena in former times, today you come to the town square Piazza dell’Anfiteatro. Cars are not allowed to enter the square. From the original Roman theatre some things are still preserved. For example this mighty gate (see picture). It makes sense to walk around the antique amphitheatre. In Roman times the amphitheatre was used for various performances, including gladiator fights and chariot races. Later, the arena served as the city’s warehouse for salt, for example. The Anfiteatro was also a prison for a time. In the past, meetings of the citizens of Lucca also took place on the oval square. Later it was also a market place. Today you can only see the outlines of the inner arena of the ancient theatre of Lucca. Where today’s houses are were the grandstands for about 10,000 spectators. On the 27th of April every year there is a big festival with flowers on the Anfiteatro square. In addition to cafes and restaurants, the old arena also has some shops (souvenirs, etc.). Unfortunately, the restaurants on the square tend to have high prices. But you can also enjoy the atmosphere of the amphitheatre of Lucca over a coffee. Where is the arena of Lucca? The amphitheatre is located in the northern old town, within the mighty city wall of Lucca. The well-known central street Via Fillungo connects the cathedral in the south of the old town with the ancient elliptical amphitheatre in the north. 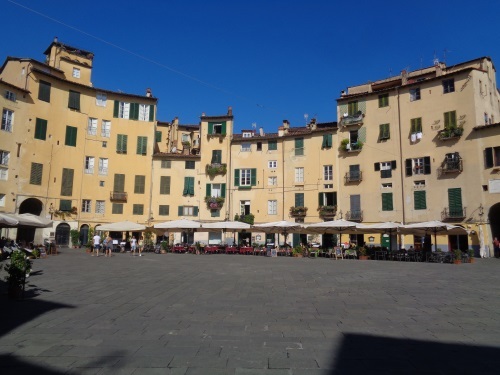 The „Piazza dell’Anfiteatro Lucca“ is in the old town, inside the city wall.